Traffic calming measures are to be implemented on a busy country road to the south of the city to protect residents from the increasing number of vehicles effectively using the thoroughfare as a rat run. Transport NI have agreed to take steps to discourage speeding at the Nixon’s Corner end of the Braehead Road, which links the Creggan and Brandywell areas of the city with Killea and Molenan on the Donegal border. Sinn Féin councillor Patricia Logue, who has been lobbying the department for action, said it will improve safety for residents of an increasingly populated area. She said: “I welcome confirmation I have received from Transport NI that traffic calming measures on the Braehead Road at Nixon’s Corner have been given the go ahead. Colr. Logue has also learned that the Ballinacross Meadows housing estate - a small close at the Nixon’s Corner end of the road - is also to be adopted. This will mean street lights can be fixed and the footpaths upkept, she said. “I am also pleased to announce that the Ballinacross Meadows development is to be earmarked for adoption. “This will mean the fixing of streets lights and the upkeep of road and footpaths. I have been informed in correspondence with officials from the Department of Infrastructure that it is anticipated this work will be carried out in Ballinacross around August/September time,” said Colr. Logue. The Sinn Féin councillor for The Moor area said the developments were the fruits of intensive lobbying. “This has been a very long campaign on both fronts so I am pleased we have finally got to this point. “I would like to thank Transport NI which was formerly Roads Service and local residents who I have been working with on these issues over many years for all their help,” she said. Elsewhere in the city Colr. 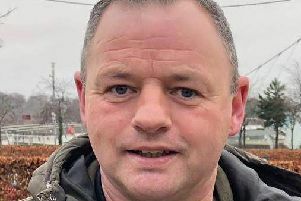 Logue’s party colleague Mickey Cooper has succeeded in having ‘slow’ signs painted on a number of residential streets in the Strand Road area. “Slow markings have now been installed in the Governor Road, Meadowbank Avenue and Philip Street areas ay my request by Roads Service in response to residents’ demands that motorists reduce their speed when driving through the area. I hope it will prove effective in reducing dangers for residents, especially children living in the area,” said the Foyleside councillor.